The Ghost in Roomette Four is published by Perseverance Press. Read an excerpt and learn more about what’s in store for Jill in Janet’s blog posts at Bookbrowsing: “What’s A Zephyrette?” and “All Aboard for Adventure.” Step back into the 50s with Janet’s post for Killer Crafts & Crafty Killers. The book is available from Amazon, Barnes & Noble, Kobo, IndieBound and iTunes. It’s been 50 years since Fern Chatfield disappeared. What happened to her? Did she run away? Or was she abducted? Maggie Constable wants to know how the story ends. A warm June evening. A high school graduation party. Fern ends her relationship with her boyfriend Hank. He doesn’t take it well. In fact, he tries to hit her. But Fern’s best friend Maggie intervenes. After Hank stalks off into the darkness, Fern says she’s going to walk home. But she never gets there. Fifty years have gone by. Maggie’s a tough-minded veteran reporter, accustomed to pursuing the truth. This story has haunted her for years. She goes to her 50th high school reunion, determined to find out, once and for all, what happened to Fern. Buy But Not Forgotten at Amazon. Buy it on Amazon for one low, low price! 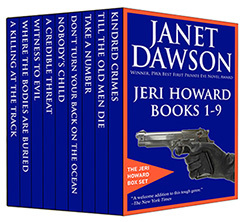 This bundle includes the first nine books in the award-winning Jeri Howard murder mystery series, from Kindred Crimes to A Killing at the Track. Pay only $9.99 for hours of great reading! 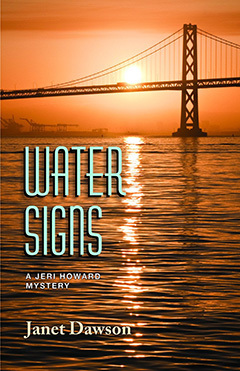 Water Signs is published by Perseverance Press. You can read an excerpt and purchase it from Amazon, Barnes & Noble and IndieBound. Get a FREE short story, "Invisible Time," featured in the anthology San Francisco Noir 2: The Classics, when you sign up! Janet will be on a panel on Friday at 1:30 PM: “Detectives of the Past & Present,” with Matt Coyle, Carola Dunn & Charles Todd (Caroline). 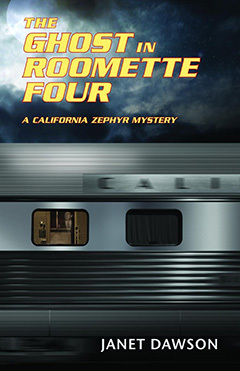 Janet will be discussing her California Zephyr mystery series on Saturday at 11:30 AM in the McClellan Room.